This is a beautiful gourmet grocery store that has recently upgraded and expanded their cafe, even adding outdoor seating. I shop here once in a while, mostly for the rubbing-elbows-with-upper-east-siders-experience and excellent customer service- but not for the outrageously high prices or crowded aisles. I sometimes go in for produce, some cheese and a piece of fresh fish, and walk out $50 later wondering where my money went. The cafe however, seems to be from another world. The prices are totally reasonable, the service is super fast, and you can always get a seat inside or at the new outside tables. 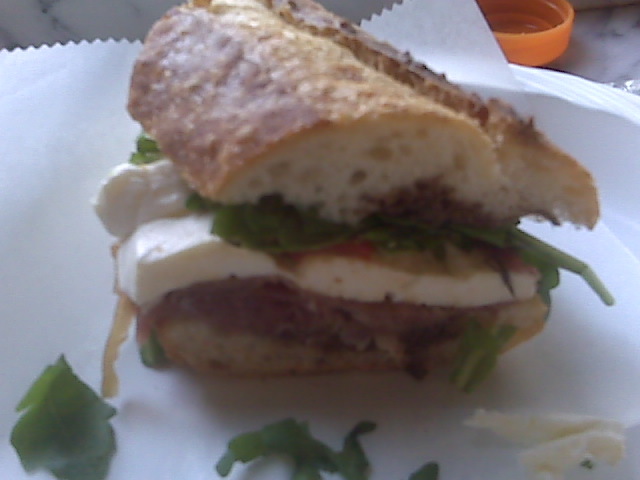 My lunch today was a delicious prosciutto, mozzarella, roasted red pepper, arugula sandwich on amazingly fresh baguette with a balsamic vinaigrette. The ratios of meat to cheese to bread were spot-on and the quality of the ingredients were superb. I had a peach ice tea to drink that was SO fruitylicious- not a chemically note to be found (like some other mainstream brands). 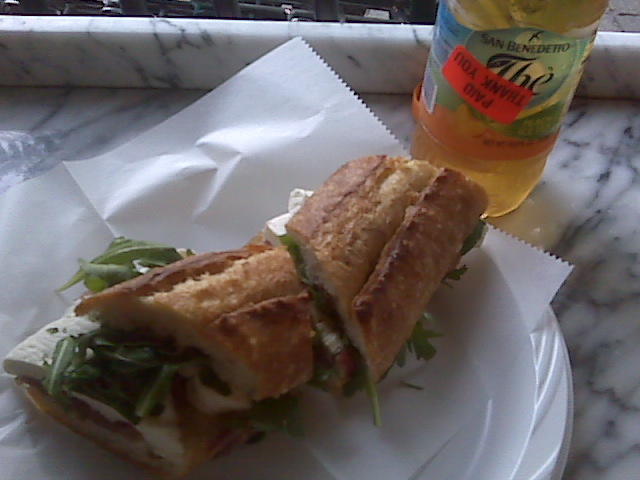 This lovely lunch cost me around $8 and was worth every fairly-priced cent. I will definitely stop in more often now that I know what a perfect meal I can get there when time is an issue. It’s only about 2 blocks from my apartment which makes it even better. Almost all of the seats are up against windows which makes for an excellent people watching vantage point. See ya there!